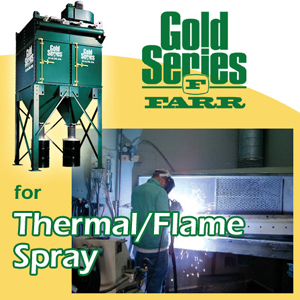 The FARR Gold Series® dust and fume collectors provide a wide variety of configurations to operate safely and efficiently in thermal/flame spray operations. Explosion vents, sprinkler kits and fire retardant cartridges are some of the many options available to customize these systems. Gold Series® collectors feature a new modular design for optimum field flexibility. Each module accommodates airflows up to 5,000 cfm using four cartridges mounted in a symmetrical frame. Additional modules may be added to meet total airflow requirements beyond 100,000 cfm. The Gold Series module is constructed of 7-gauge carbon steel. The door, hopper, inlet and panels are all 10-gauge steel. Most other dust collectors on the market are only 12 gauge. All Gold Series dust collectors are powder painted for unsurpassed weather and corrosion resistance. Designed in modules, the cross flow inlet, access door, explosion vent and other components can be installed on any side of the module to meet individual needs. The available configurations are virtually unlimited. This gives you a customized dust collector, delivered fast. The vertical design of FARR cartridges provides more efficient pulsing of dust; thus eliminating uneven dust loading associated with horizontally mounted cartridges. Enhanced performance features with exceptional ease of installation and service make the Gold Series the ultimate choice for a clean workplace.